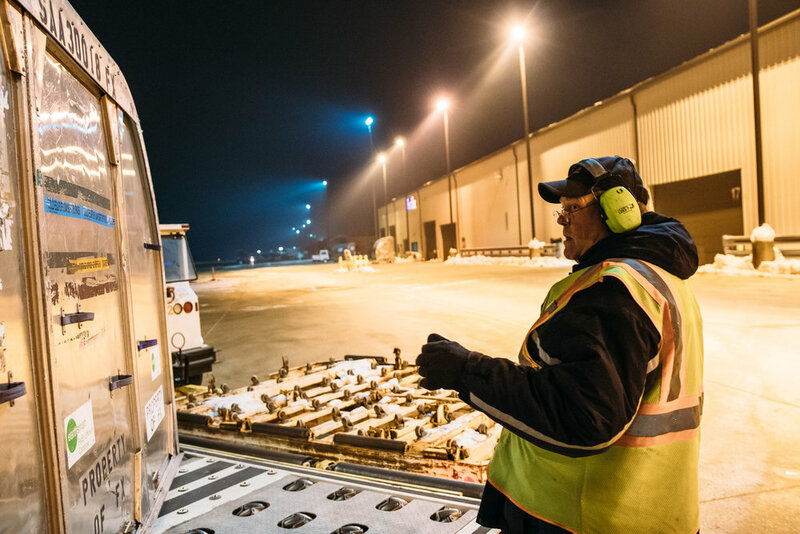 It is just before dawn on a chilly winter morning and crews are beginning to take their positions outside the cargo terminal at Rochester International Airport. They are awaiting the arrival of a jet coming from Memphis with more than 40,000 pounds of cargo on board. Once the plane touches down, three dozen ground workers begin unloading large crates filled with packages bound for destinations across the region. With trucks lined up ready to depart, the team works like a well-oiled machine — sifting, sorting and scanning through thousands of packages with care and efficiency. In a community known worldwide for hope and healing, this daily delivery of cargo plays a vital role in ensuring patients receive timely diagnostic results and life-saving treatments. “It’s incredible the people’s lives that are in those planes — even though there are no passengers on them,” says Dr. Andrew Paulsen, supervisor of the Nuclear Medicine Radiopharmaceutical Lab, Mayo Clinic. Working in a laboratory, Dr. Paulsen and his team at Mayo prepare radioactive medications for diagnostic and therapeutic purposes, including targeted treatments of some forms of cancer. “Some of our medications that we will be administering tomorrow are just finishing up manufacturing today and they are getting on a plane, and we have one small window in time when that medication is still good for that patient,” says Dr. Paulsen. That means within a matter of days, someone across the ocean may be splitting an atom in a nuclear reactor, irradiating some sort of target with radiation, and creating the needed medical isotope that gets shipped to Rochester. As Dr. Paulsen explains, if not for the airport’s proximity, Mayo Clinic would not be able to meet the demanding schedule that is needed to care for patients. “There are times when we are picking up a vial of medication that was made in Italy and whisked here in a matter of a couple of days time so it can treat someone’s cancer and help alleviate symptoms for a disease they are struggling with. It’s pretty remarkable,” says Dr. Paulsen. Timing also is a critical factor for the nearly 40,000 medical specimens that come through the Rochester airport every day for delivery to Mayo Clinic Laboratories. Specimens from more than 4,000 clients arrive from more than 70 countries. Domestically, specimens are usually overnighted, while those coming internationally usually take a couple of days. Often, patients are searching for answers they cannot get in their local hospitals. By having the airport just down the road, Mayo Clinic Laboratories staff are able to get specimens early enough to have them tested by noon. Ultimately, that means a physician at a hospital across the country, or even across the world, may have the results they need to administer care that day. “That may mean somebody can go home, who otherwise might have needed to stay in a hospital that night,” says Tom Griffin, global logistics manager for Mayo Clinic Laboratories. Griffin says that if specimens were flown to Minneapolis and then shipped to Rochester, Mayo Clinic Laboratories would lose about three hours each day, pushing the entire schedule back. Instead, having access to freight carriers through the airport, Mayo Clinic Laboratories is able to quickly get patients around the globe the answers they need.